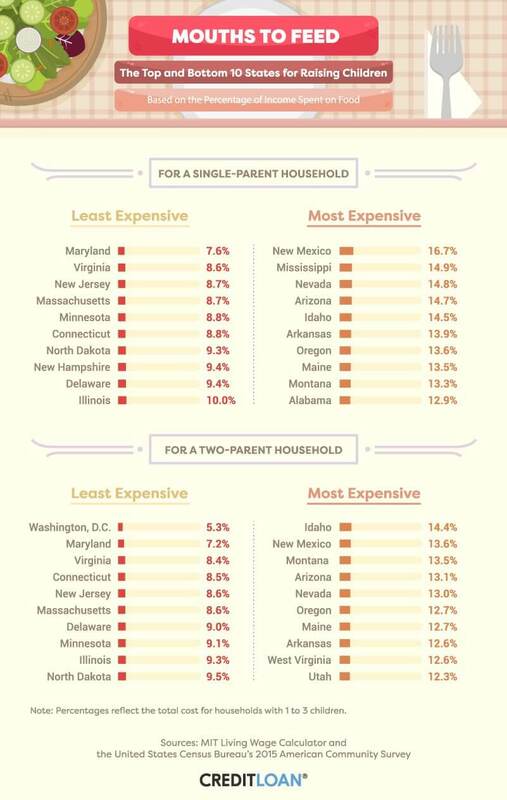 We crunched the numbers to find the most and least expensive states for raising kids. How does your state stack up? Raising a child – or even multiple children – can be one of the most expensive investments an American makes during their lifetime . According to the most recent data from the U.S. Department of Agriculture, the average cost of raising a child to age 17 is over $220,000 – roughly $12,000 to $14,000 a year. But what does that mean for Americans in parts of the country where the median income is lower, or the cost of living is higher? 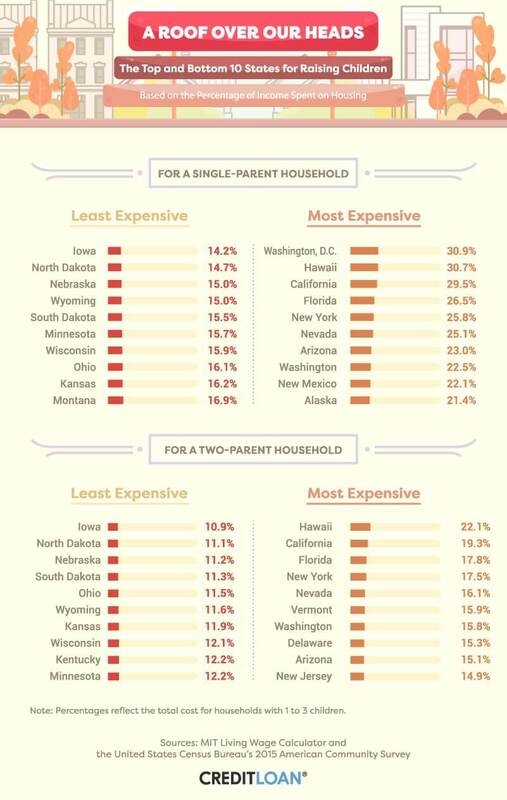 To zoom in on the unique costs of child rearing across the U.S., we utilized the Massachusetts Institute of Technology's (MIT) Living Wage Calculator for all 50 states and Washington D.C. to determine which parts of the country might be the best for raising children, and which may be the most costly. From families of just two to families of five or more, we studied the cost of elements such as housing, child care, and health care. Continue reading to see what we learned. What portion of a family's income in each state is spent on the basics? We calculated what you can expect to spend on life's necessities in all 50 states and Washington DC and then ranked them according to six major categories. Use the interactive tool below to see what people in your state are spending compared to your neighbors. If you think diapers are the biggest expense you'll encounter as a parent, think again. Most babies will use 2,700 diapers their first year alone. Averaging more than seven diaper changes each day, that adds up to a lot of time and money for most new parents. Things that will take up a much larger part of your baby budget? Housing, food, and day care – in that order. 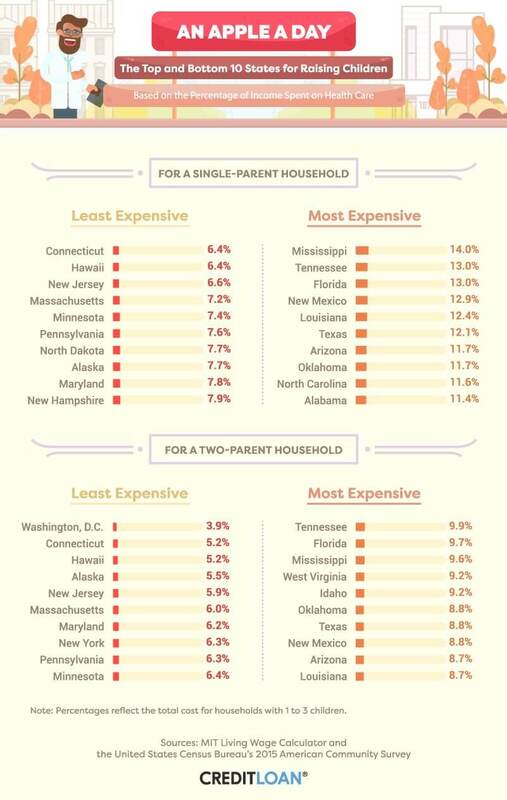 The cost of each can fluctuate fairly significantly from state to state, but, on average, housing costs account for nearly a third of the total estimated cost for raising kids when you factor in potential additional bedrooms and higher mortgages. Food can account for another 18 percent of the average budget, while child care and education typically add up to 16 percent. On average, child care for just one kid can cost families nearly $200 a week. That's $800 a month, and $9,600 a year. Of course, all of this varies depending on where in the U.S. you live and how much you earn. By utilizing MIT's Living Wage Calculator, we determined that the best states to raise a child based on the median income of Americans were New Jersey, Maryland, and Connecticut – where parents can expect to put less than 60 percent of their total income into child-related costs. States where you should expect to pay more? Nevada (nearly 86 percent), Florida (84 percent), and Arizona (80 percent). Deciding to expand your family can have a significant impact on the amount of money you should budget per child each year. 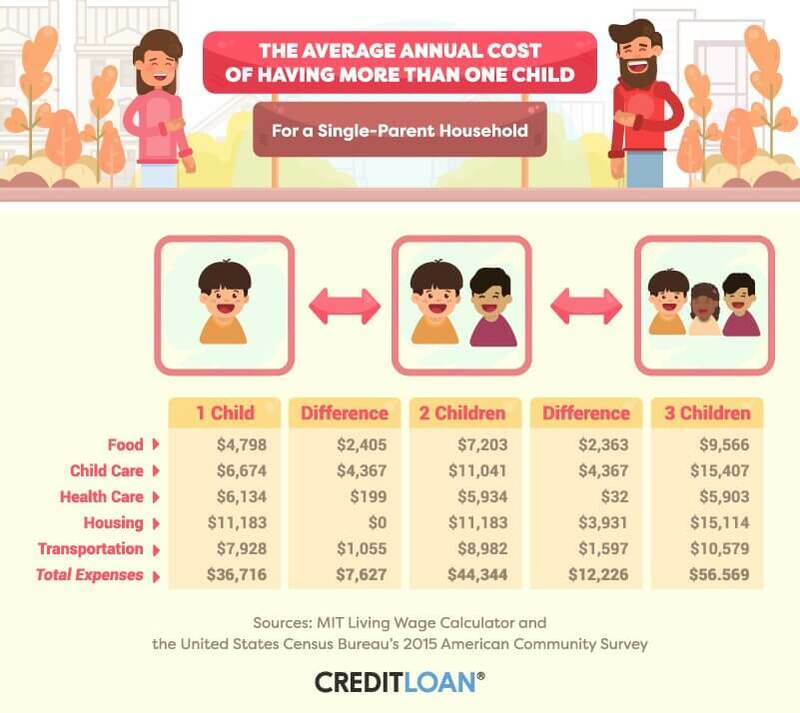 If you live in a single-parent home, having multiple children can raise the average cost of child rearing in some ways or leave it unchanged (or even lowered) in other ways. 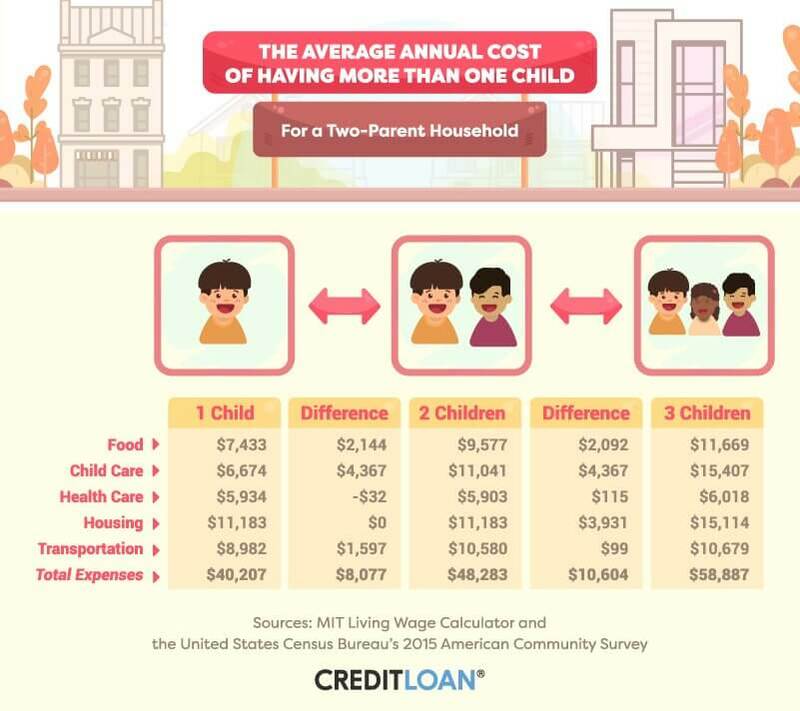 By combining the MIT Living Wage Calculator with data from the 2015 U.S. Census Bureau's American Community Survey, we determined the difference between single parents raising one child and two children was $7,627 on average. The cost difference between raising two children and three jumped to roughly $12,226. Expenses that saw the biggest average increase between the number of children included child care (more than $4,000 extra per child), food ($2,400), and transportation (over $1,000). Research has found that a traditional two-parent family can earn up to three times more than households supported by a single parent, an increase which typically results in higher spending on child rearing. We found that Americans living in two-parent households spent an additional $8,076, on average, when their families grew from one child to two – an increase over single-parent homes. In contrast, expanding their families from two children to three averaged an additional $10,604 for two-parent families – roughly $2,000 less than the cost for single parents. Child care costs and housing typically remained the same, while the cost of food, healthcare, and transportation saw an increase for larger families in two-parent homes. The world is full of advice on what you should feed your child. From nursing routines to solid foods and feeding schedules, one thing is certain: The cost of food for kids can certainly add up. With so much information on what you should be feeding your children (like the debate between organic and conventional) – and given that food in some states simply costs more for geographical reasons –how much of an American's total income allocated to food for his or her family can vary. Using the MIT Living Wage Calculator, we determined that single-parent families spent the lowest percentage of money on food in places like Maryland, Virginia, and New Jersey. In contrast, states where food was potentially more expensive, or where parents earned less on average, saw twice the annual percentage of income spent on food. In New Mexico, a single parent could expect to spend more than 16 percent of their income on food alone, and more than 14 percent in states including Mississippi, Nevada, and Arizona. In two-parent households, the results were slightly varied. In Washington, D.C., where the median income is the highest in the country, parents spent just over 5 percent of their total income on food. Maryland, Virginia, and Connecticut also ranked among the lowest overall percentages, ranging from 7.2 percent to 8.5 percent. In Idaho, the percentage of total income spent in a two-parent household for food was nearly three times the amount a family in Washington, D.C., spent – 14.4 percent. The cost of child care in the U.S. has gotten so high that it's even become a talking point for politicians. While President Donald Trump and former Secretary of State Hillary Clinton may have had different ideas on how to reduce the stress of day care costs for Americans, they both recognized the impact these costs can have on families of all shapes and sizes. Although the cost of child care in the U.S. is among the most expensive in the world, there still aren't enough day care centers to meet demand in some parts of the country. Our use of the MIT Living Wage Calculator found that the cost of child care could be far more significant for single-parent homes than two-parent families. In states like Louisiana, Tennessee, and South Carolina – where the percentage of income spent by single parents on child care was the lowest – a single parent would still spend more than $1 out of every $10 earned on day care costs. In places like Washington, D.C., Nevada, and New York, that cost increased to roughly $3 out of every $10. For two-parent homes, Louisiana, Mississippi, and South Carolina represented the lowest percentage cost for child care – roughly 7 percent of their combined total income. In Nevada, New York, and Wisconsin, that percentage more than doubled to over 15 percent. Health care has become one of the most contested topics in American politics. While more Americans may have health insurance than ever, roughly 1 in 4 children are either completely uninsured or don't receive proper care in response to rising costs. Like the cost to single-parent homes, the percentage of parents' income spent on child health care peaked in Tennessee, Florida, and Mississippi at nearly 10 percent each. The amount of money it costs to rent or buy your home is one of the single largest expenses an American family incurs. More than that, the cost of housing across the U.S. has been rising over the last five years and may continue to do so at nearly double the existing rate. For now, the standard interest rate on mortgages (as set by the Federal Reserve) has remained relatively steady, helping to keep the monthly out-of-pocket cost of buying a house relatively low for many Americans. Still, for single-parent and two-parent families alike, a growing family often means a growing home as well. According to our study, housing accounted for the lowest percentage of family incomes in Iowa, North Dakota, and Nebraska. For single parents, buying or renting a house in those states accounted for 14 percent to 15 percent of their total earnings, and 10 percent to 11 percent for two-parent families. 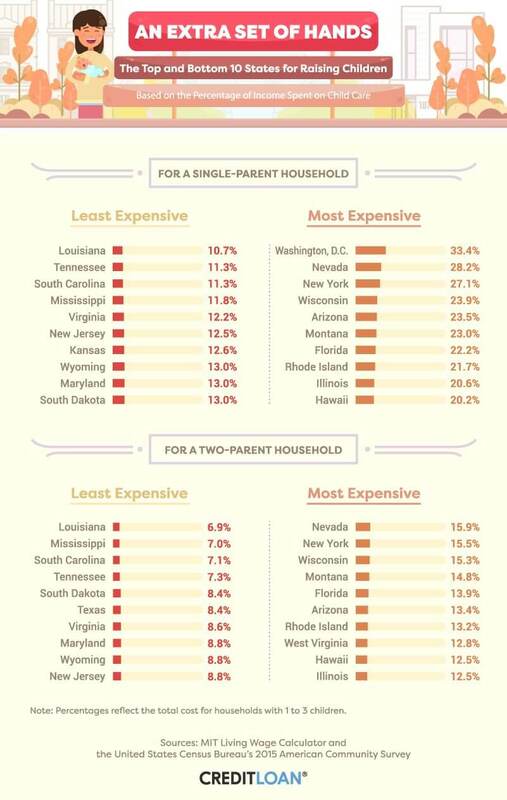 For single parents, the percentage of income spent on housing more than doubled when looking at the most expensive region in the U.S. – rising to nearly 31 percent in Washington, D.C. Families with dual incomes saw a similar percentage increase, though housing was the highest for them in Hawaii, California, and Florida. Transportation costs may be on a downward trend thanks to falling gas prices, but that doesn't mean trips to and from school, aftercare, and even extracurricular activities don't add up for single-parent and two-parent families alike. As children get older and their daily activities begin to increase (or they start to drive on their own), overall transportation costs can rise. Our study found the percentage of annual income spent on transportation by single parents ranged from more than 9 percent to nearly 22 percent, depending on the location. Costs were lowest in comparison to the median income in states like New Jersey, Massachusetts, and Connecticut. The highest costs resided in Mississippi, Arkansas, and Alabama. 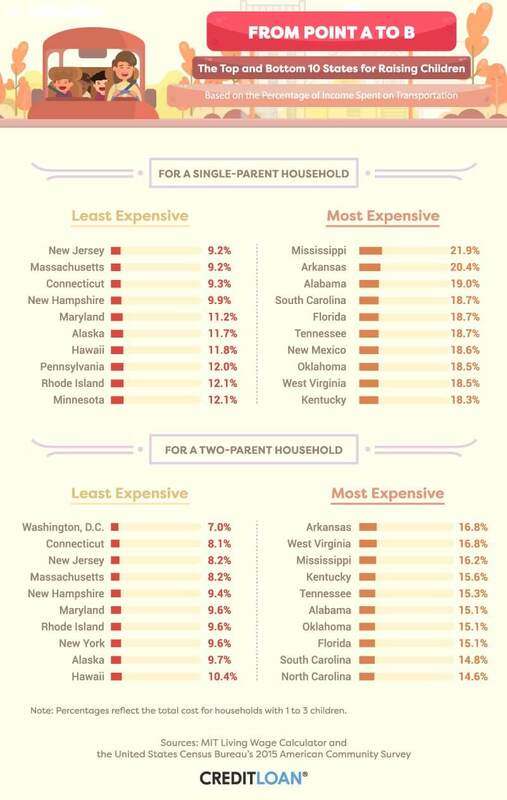 For two-parent households, the range for transportation costs ranged between 7 percent and 17 percent and was lowest in Washington, D.C., Connecticut, and New Jersey. Regardless of where in the U.S. you live, the cost of raising children can certainly add up. More than just getting by, you may also be concerned about raising a family and saving for retirement (or even just the cost of college). For both single-parent and two-parent families, expenses stemming from food, housing, and health care accounted for as much as 85 percent of their total income. States with some of America's biggest cities (including Florida and New York) continually ranked among the most expensive states for raising children based on the median income and data from the MIT Living Wage Calculator. At Credit Loan, we believe in making credit cards and personal loan solutions work for your family's financial needs. By understanding how to maximize credit card rewards options and maintaining a quality credit score, you can make the cost of food, gas, and more work for you. Reach your financial goals with the best in financial advice and solutions in one easy-to-access place. We analyzed state-by-state data for typical expenses using the MIT Living Wage Calculator and compared it to the U.S. Census Bureau's data for annual median income. The data from both sources represent 2015 and were collected in July 2017. For the information above, we considered only single-parent and married-couple households with one, two, or three children. Want to spread the word on places where your and other families would thrive? We grant permission to use any of the images, facts, and text above for noncommercial purposes. We only ask that you cite the author and link back to this page when you share.